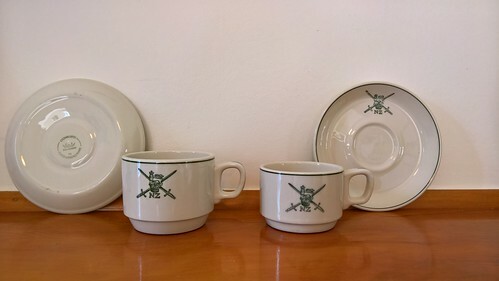 NZ Army cups - how many different styles? 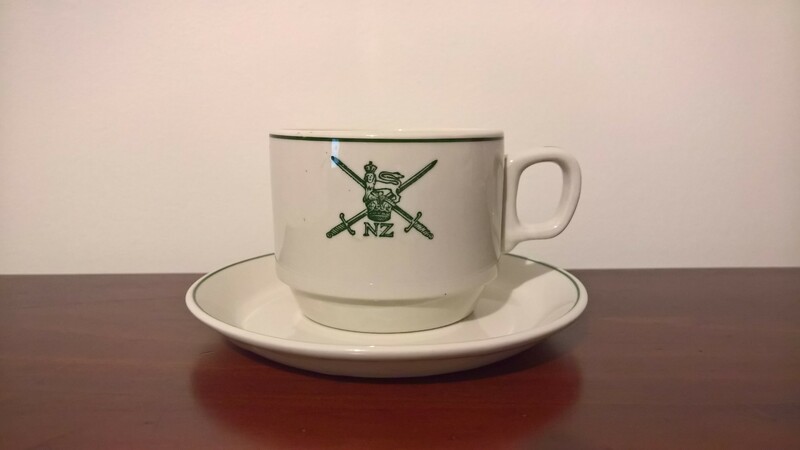 Today I finally acquired an NZ Army monogrammed Hotel Cup (incorrectly matched to a stackable cup saucer, something I've noticed a couple of times on Trade Me this year [edit: perhaps not incorrectly matched after all - thanks Jeremy!]). 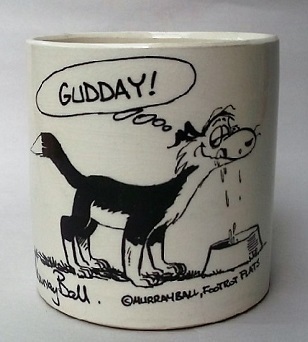 A bit pricey for the cup but it's in excellent condition, and lovely to drink out of. 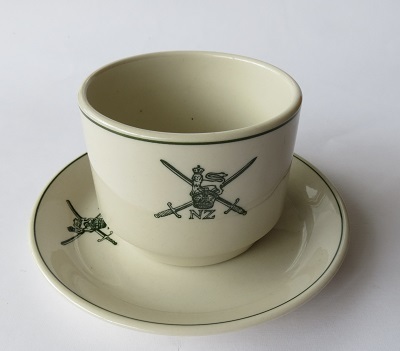 My question is: are there any other known style of cup used by the army? I know that the Air Force used Carlton cups at one stage but I've not seen that cup shape for any other branch of the armed forces. No idea what it means but interesting none the less. 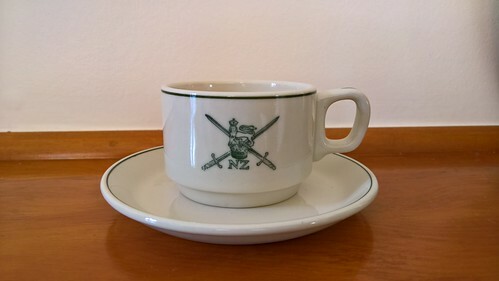 Re: NZ Army cups - how many different styles? In its later years Crown Lynn used some strange pairings of cup and saucer. Those included hotel cup (700) with the ubiquitous 4019 saucer, which you show under the 3610 tall coffee cup, and 3610 cup with 4624 stacking hotel saucer. 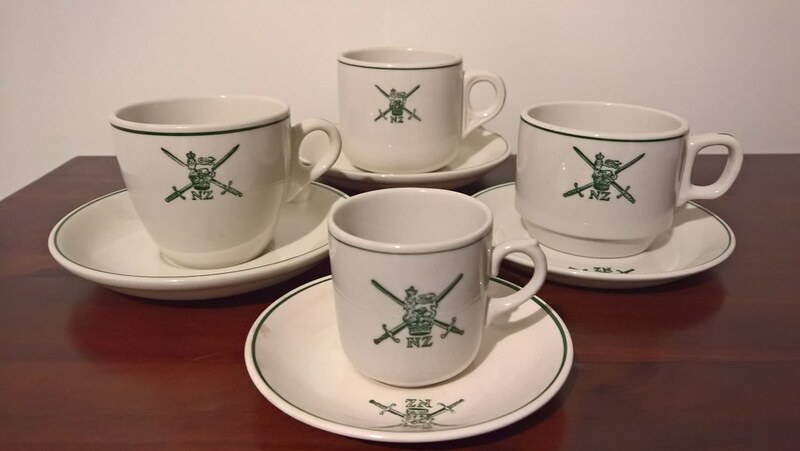 If you were to swap the saucers under the hotel cup and tall coffee cups they would both be pairings used by CL (although not necessarily for its army wares). 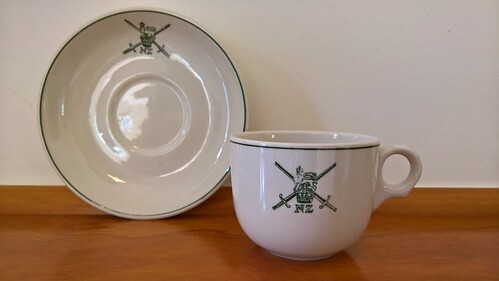 Carlton cups were originally used with 739 saucers (as shown in the photo Ev posted), later with 4019. The demitasse you show is the earlier version. The later one had a heavier handle and different saucer. Maybe something to watch out for. One vitrified cup I don't see here is the 863 tulip. I have no idea whether it was used by the army. It is likely the "59" is a production year (but that wouldn't explain your two "0"s). The earliest number I've seen from the latter supervitrified stamp numbering is "5" for 1965 on both a plain cup and an NZR one. I think GibPat vitrified ware numbering started with "1" for 1961. Ev has reported from someone at CL that different numbering methods were tried but the methods were not specified. Apart from your 59 type number stamp many shapes from the early 1960s, especially vitrified ware had impressed numbers and letters but no explanation has been found for that yet. Eds: Ev's comment below acknowledged. Just to clarify your comment about different numbering systems tried Jeremy, it was Alan Topham who told me that at one time they also added the month and the year on the base. I have only seen this twice and once was on ebay Australia. One was 8/71 which would represent August 1971. I also have an army badged cup shape with no handle. It was bought with a saucer which it fits perfectly. It is probably a sugar bowl but it could be a cup made with no handle for easier packing??? 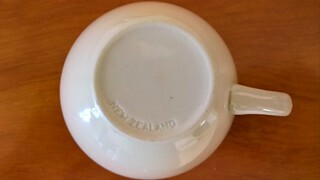 The "Made in New Zealand" is the cup/bowl base. Edits to add pics which I miraculously found. Wow lots of replies - thanks everyone. Jeremy - Do you mean the 4619 saucer? Thanks for the information about the different pairings. I have tried out some of the combinations that you've listed (and as noted the 3610 cup came on a 4624 stacking saucer when I purchased it), but the cup/saucer never quite felt like they fitted properly. However still good to know why these combinations are around. 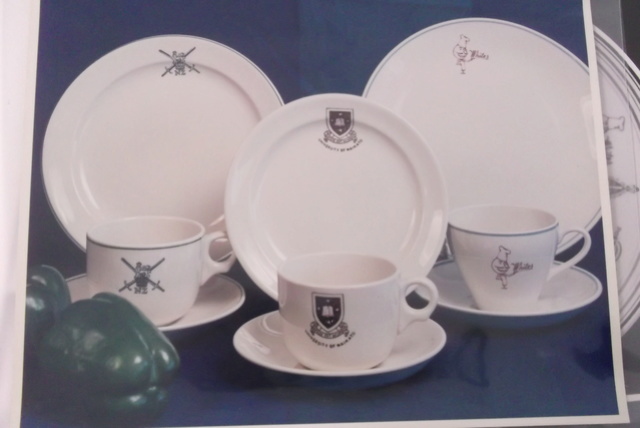 Also good to know that Carlton Cups can be matched with the 4619 saucer as these seem to be comparatively easy to find, and my RNZAF Carltons could do with matching saucers at some point! Maryr - that is an awesome photo - thanks for locating it! I have a couple of stackable sugar bowls and yes, they fit the stackable saucers perfectly. Question - are the sides of your example tapered or if it is just a trick of the camera? The ones I have look just like the below image without the handle. As such it is entirely plausible that they were used for both roles - as a cup and as a bowl - as necessary. Hi again BrunoL, the sides of my bowl/cup are straight up and down. Bruno, sorry yes typo or brain glitch 4619 not 4019. I'll leave it now for continuity. Many years ago I bought a stack of 3610s and 4624s and didn't like the fit so I moved them on, only later to find that at some time they were sold that way. A cup that is sloppy in the saucer is a bit annoying aesthetically but when the saucer seems too small, that is just not on. At the start it appears that Ambrico made just one "Paris" saucer shape to fit all its various attempts at cups, including the early 700-type cups (which they actually matched well), but then they settled down to really good matches until about 1979 [belated correction: 1969], about the time the 4619 became the ubiquitous saucer for almost all vit cups. The advantage of the 4619 I guess is that it is small and sturdy, but that also makes it clunky and for the 700 cups way too small, especially as the cup size actually increased a few years before the 4619 was released. I think the worst match is putting 3050s and 3077s on 4042s. The cup well approximates the diameter of the cup rather than the footring. As you have done for the Army monogram duo I have done for the Reflections pattern duo. I don't recall any other pattern being produced in so many shapes, however if I had collected the two red band cups I think I may have equalled the Reflections. and for me the most surprising... a 3616 or 3619 shaped cup. The saucers for the Carlton and 361X cups aren't correct to my eye being 4619's, but they will do for now. Also, I was surprised at just how little the stackable coffee cup holds - obviously not designed for milk with your coffee! 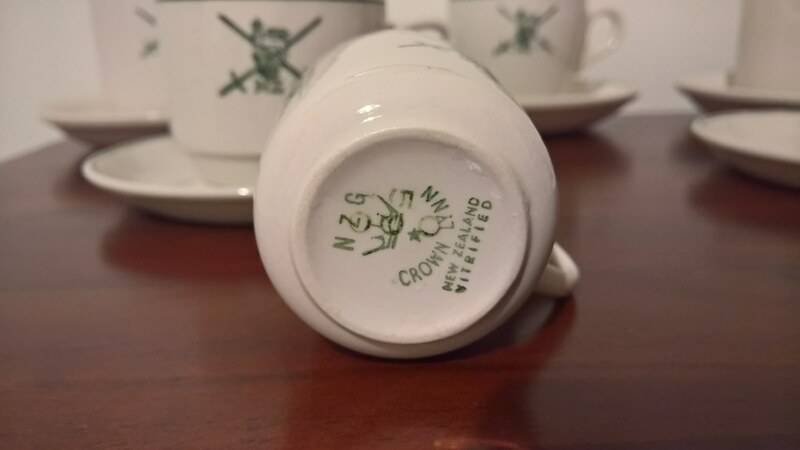 I think your 361x (3616 or 3619) cup should ideally be on a 4615 saucer, like the Army ones you just got, but if the cups are dated 1969 or later then the 4619s should be right, as that was the replacement shape. Some shapes to look out for: stacking TEA cup (or is that one you have already a few posts up? ), later heavy-handled demitasse. The Carlton has the crown & star backstamp, so this saucer isn't really the right match either, but it works for now so long as I don't carry the duo by the saucer alone (least it wobble and slip off). Note the best picture but I've not got both tea and coffee stackables. I originally thought the coffee would be the same dimensions as the tea cup, just with lower sides, but the coffee cup is also (in my case at least) slightly narrower as well, and doesn't stack well with the other stackable cups, sugar bowls and jugs. 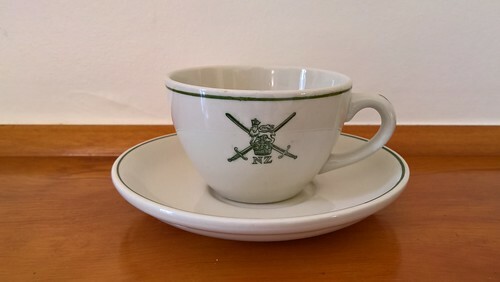 Oddly enough I haven't yey come acorss an amry demitasse with the thicker handle yet for army, though other branches have them. They must exist, but only the earlier versions with the thin, delecate-feeling handles have turned up so far. The impressed New Zealand 361x is a perfect match for the 4615. The NZG star and crown 755 Carlton should have a 739 saucer, but the later ones would have a 4619, from 1969. Not sure of 65-69 but I think a 739 still. I can't remember the 755/4615 combination that you bought but if you check through all the topics you should find notes on matches as sold from Ev or janpots who have done the paper work. Those topics of mine like the Reflections ones are works in progress and it looks as though we had not established which of the two was the 4619 at the time. My photo shows a 4619 with the 755. My cup and saucer shape matches are "as found" but only when it appears to me that they are likely to be genuine original pairings. Pairings from Crown Lynn documents are likely to be more reliable. 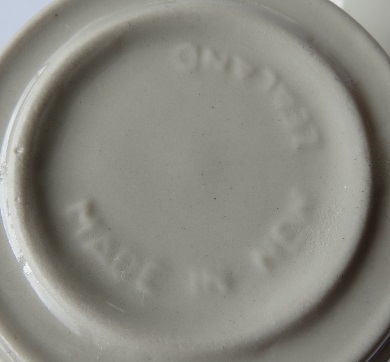 This is harder for vitrified wares than earthenware as in the commercial setting cups and saucers get mixed up. Matching dates certainly makes it easier. I'd still go with ones I've suggested above. I'll have a look for Ev and Janice posts a bit later on to see of I can find something reliable. It's a pity there is damage to the saucer as cup and saucer appear to be a match for age. 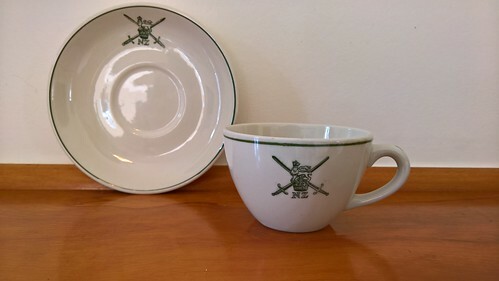 I say appear because of the backstamp but on re-inspection I see that the saucer does not have a roll edge and the saucer to match that cup should. I'd place the saucer at 1955-60 and the cup at early 60s onward. Thanks Jeremy - it's been a good run on Trade Me lately (for the variety, if not the budget). It's good to finally be able to confirm it's existence even if I'm not successful in this auction. It's also interesting comparing the base of this cup with the earlier one at the top of this post. Instead of being stamped and with a smooth base this later cup simply has New Zealand impressed into it's base, similar style to the 361X cup. 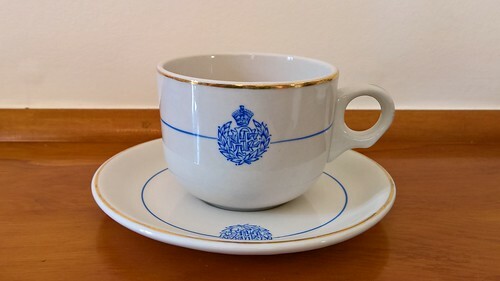 I'd agree also with your thoughts on the saucer, - it's identical (bar the crack) to my earlier style demitasse pair. It arrived today - the stout-handled Army Demitasse! This brings the list to at least eight known styles now, up from the four I knew of less than two months ago. This includes the surprise (to me) 361X shaped cup that I hadn't ever considered might exist in this style. Due to some very good fortune on Trade Me, I also now hold examples of each of these eight styles. (Also, I am now broke ). I've updated the list on the first post and copied it below. I'm not expecting many more shapes to appear, but I'm not foolish enough to rule out other shapes either! Yes - I know technically the two demitasse's are the same shape, but to me the two styles are visually quite distinct so I'm counting them as two separate styles. Of course the two 773s are different shapes, even if they have the same number. Their saucers are different shapes and have different numbers, 774, 734. Bruno, we've had some discussion about pattern differences with RNZAF wares but what do you know about Army pattern differences. I don't think there is much in the green strip on some handles that one tm seller seems to think is important (you have some with some without). The presence or absence of the green border may have some significance though. Have you formed any opinions on that? Also, reviewing you collection, I now have reason to say that the 3610 cup may be paired with your 14.5cm mystery saucer shape as I have such a pairing with my newly acquired Labour Party duo. I'll be writing more about that in your "4615" saucer topic later. The saucer in the above listing must surely be wrong as, even though both pieces have the same no border design the saucer shown is a 702. (Seller gave me measurement of 15.5 OD.) Does your 3610 have a dated (or any) backstamp? I've not yet seen a piece with a green border dated later than 81 (disclaimer - I have seen some with smudgy back stamps that could read 81 or 87). I've not yet seen a piece without the green border dated earlier than 83. Bring on the examples that will prove me wrong . 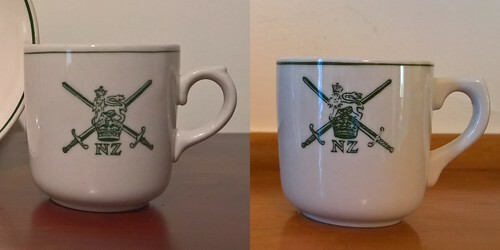 the NZ Army crest in the pieces without the green border is often (but not always) a slightly different shade of green to those with the border. The back stamp of pieces without the green border tends to be in black with larger writing. 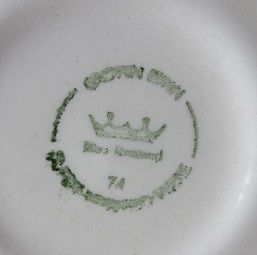 The back stamp of pieces with the green border is usually green, with smaller writing. When Bristile took over manufacture in 1990, they appear to only have produces pieces without a green border. Based on the above, we can hypothesise that there was a change in design around the 81-83 mark to drop the green border (and the green handle stripe) from NZ army ware. But I've no hard evidence to confirm this yet - just a causal observation. Also, sadly (but not unexpectedly) my 3610 lacks any back stamps, and simply has NEW ZEALAND pressed into the base, identically to the picture of the 361X cup above (and the stout-handled demitasse I've just received). These have the green border, suggesting this was first dropped in 1983. Curiously, it also has the newer, black backstamp, suggesting that this came into being in 1982.